Dennis Bertram paints highly simplified houses, churches and other structures to create large complex paintings. 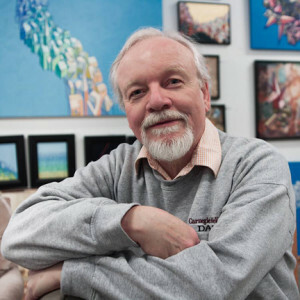 His compositions were “driven by the concept of the complexity of living and the missteps experienced making decisions which do not result in expected outcomes.” His work has developed into “skyships,” which are floating masses of structures, and have led to his most recent work where he combines older realistic paintings with his skyships. This paintings became an allegory for the experiences that destroy, invade, take, dominate and assimilate in our lives. Bertram was born in Valkenburg, Netherlands and emigrated to Evansville, Indiana when he was a child. He graduated from Indiana University with a degree in zoology. He later graduated from Washington University School of Medicine and Johns Hopkins University with degrees in medicine and public health. He is currently a full time artist, but has previously held faculty positions at Johns Hopkins University and University at Buffalo. In 2008, he was among 66 artists selected from across New York State to participate in the New York Foundation for the Arts MARK program, a program to teach professional artists more of the business side of art. He maintains a studio at Buffalo Arts Studio.